You’re a business owner, so I can guarantee you are swamped with the everyday responsibilities of running your company. You can use marketing help in any way possible, right? Fortunately, Facebook has you covered with a suit of must-have marketing tools. One of these creative tools is scheduling posts. It is simple, powerful, and will make your use of Facebook Pages much more effective (it does not work for personal pages). To begin, go into Facebook and create a post just like you normally would–add pictures, videos, text, whatever you want. Next, look at the publish button on the bottom right of the post window; you will see a drop-down arrow–click that. Then, click “schedule.” You will get a dialogue box where you can set a certain time and date for when you want your post to be sent out (and a date and time for when you want it to stop being distributed, if you want). Once you have selected your desired time, click the schedule button, and your post is ready to go. Why Should I Schedule My Facebook Posts? Many business people are too busy with other things to focus on Facebook. When you do have spare time, it is often when the Facebook audience is low, such as late at night. You might also find you occasionally have time to create many posts, but you can’t make time in your schedule to post regularly. With Facebook’s scheduling feature, you can create posts whenever it works for you, and have them posted whenever you feel is best for your company. This lifts a burden off of your shoulders and lets Facebook do the work. Absolutely. We recently scheduled a group of posts for one of our clients. A new video went out at 10 am each day, and neither we, nor our client had to worry about it again. 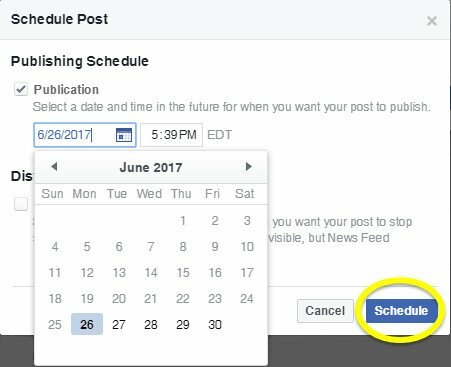 We know you are a busy person, so take some of the stress off your shoulders by utilizing Facebook’s scheduling posts feature. Stay tuned for more tips on how to use Facebook to help grow your business.